Georg Ohm measuring the current passing through the copper strip. The current is generated by the bismuth copper thermocouple. One metal junction is dipping in ice and the other in boiling water. Because there is a constant temperature difference the e.m.f. does not vary. 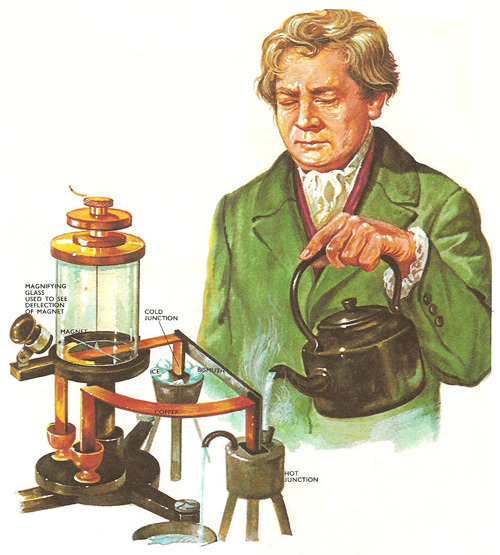 Georg Ohm was a Bavarian-born German physicist who formulated Ohm's law. He also contributed to acoustics, recognizing the ability of the human ear to resolve mixed sound into its component (sinusoidal-wave) tones. The unit of electrical resistance, the ohm, is named after him. Ohm was born at Erlangen, the son of a master mechanic who was determined that his son should be taught mathematics and physics. Late in life, his father started to learn mathematics and physics from books so that he could teach what he had learned to his son, giving him lessons when school was over for the day. When he was 16, Ohm started to study these subjects at the University of Erlangen, but unfortunately the family was so short of money that after two years he was forced to leave and take a teaching post in Switzerland. Later he was able to complete the course and gain his degree but once again lack of money forced him to leave research work at the university. So once more, Ohm became a teacher. After four years teaching in Bamberg, he spent 10 years teaching in the Gymnasium in Cologne. It was here that he did his important research work. When Ohm started his research, electricity was described in woolly terms of quantity and tension. There was no precise way of expressing the behavior of an electrical current. Ohm resolved to do something about this. Fourier had already been working on the conduction of heat and came to the conclusion that there was a continuous temperature drop along a conducting material and the quantity of heat flowing through depended on how quickly the temperature dropped. Ohm wondered if electricity behaved in the same way when potential difference was substituted for temperature drop and electricity for heat. First he used a voltaic cell as a source of electricity and completed the circuit with a long connecting wire. By connecting a capacitor at different places, and studying how much it charged (this would be proportional to the potential at the place), he was able to show that there was a steady drop in potential along the wire. In later experiments, a thermoelectric couple provided an invariable source of electromotive force. Ohm used a copper circuit into which a strip of bismuth was joined. One junction was surrounded by melting ice and the other by boiling water. He used the deflection of a suspended magnet to measure the current size and noted how the size of the current varied when different resistances were added to the circuit. He was very meticulous about all his readings and despite the primitive instruments he was using, his results were surprisingly good, good enough to conclusively prove that "The current is equal to the driving tension or electromotive force divided by the resistance." Ohm realized the importance of his findings and expected to be given a university lectureship. He resigned his teaching post but was offered no lectureship. He remained out of work for five years. Eventually, 16 years after his discovery, recognition did come. In his sixtieth year he became a lecturer at Munich University. Five years later he died.